Continuing in the series on units of the Local Defence Forces (LDF), we now turn to the 313 Force. - Khan Touman and Tel al-Eis in Aleppo province. - Breaking the Islamic State's siege of T4 airport in the Homs desert near Palmyra. - Dumayr military airport in the Damascus desert area, extending all the way to the borders with Iraq. - Deir az-Zor, including the Albukamal area on the border with Iraq. - Freeing hostages from Suwayda' held by the Islamic State in the area of al-Hamima in the Deir az-Zor desert. - The Ghouta area in Damascus. - Around 50 from the Deir az-Zor battles. - 5 from the battles of Deraa. - 10 from the battles of Quneitra. Among the other groups that the 313 Force has worked with is the Abu Ali Wafeeq group affiliated with the 215 branch of the Military Intelligence, supporting the latter's operations with dozens of fighters. 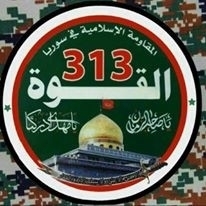 The 313 Force has been part of a grouping of battalions called Liwa al-Rasul al-Akram ("Brigade of the Most Noble Messenger"). However, by order of al-Sayyid Jawad, Liwa al-Rasul al-Akram has now become Liwa al-Abbas.